Be rewarded for telling your friends about us! Spread the love you just experienced at Beautyologist with your friends who don’t know about us. 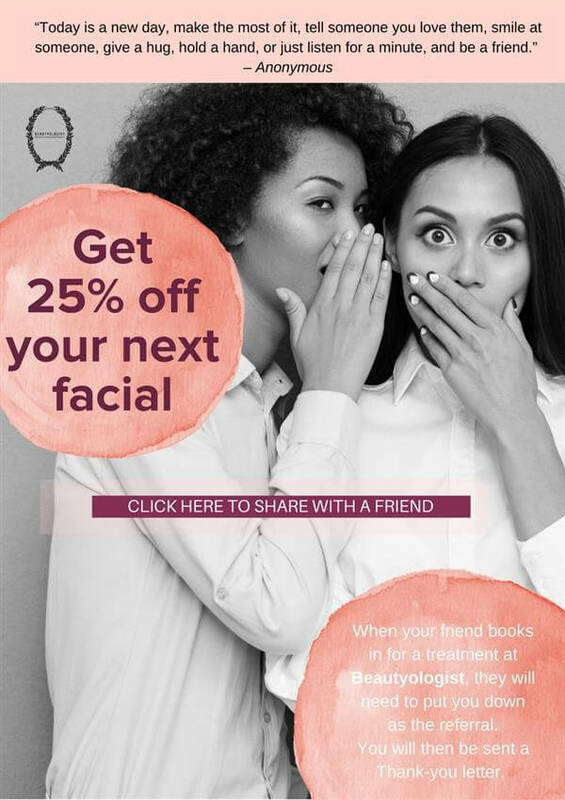 As a thank-you for the referral we will email you a gift of 25% off your next treatment with us! When your friend books in for a treatment at Beautyologist, all they need to do is write down your name on their client card as the person who referred them. Why not click on the image below to share Beautyologist with your friends? Let your friends know what you liked about us. Your gift of 25% off any service, can not be used with any other offer. It can be used at your next treatment, great opportunity to try something new. Not to be used on any products or with any free product offer.